CIMB Bank was feeling generous, so they are bringing back the bonus by rewarding RM5 each to 500 lucky 8Sharers who sign up for a CIMB Bank Kwik account! CIMB Bank Kwik Account is an account you can open online without going into a bank branch, giving you immediate usage of the account. To learn more about the CIMB Bank KWIK Account, click here. HOW TO GET THE RM5 REWARD? NOTE: The RM5 reward is not applicable for 8Sharers who have previously signed up for a CIMB Bank Kwik account. Don’t have a CIMB Bank Kwik Account yet? Get your account here: https://www.cimbclicks.com.my/wps/portal/VaRegistration! 1. The first 500 8Sharers with a valid CIMB Bank Kwik account sign up will be rewarded RM5. 2. Any entries with incomplete or inaccurate details will be forfeited. 3. ONE(1) 8Sharer is only entitled to receive the RM5 reward once during the campaign period. 4. 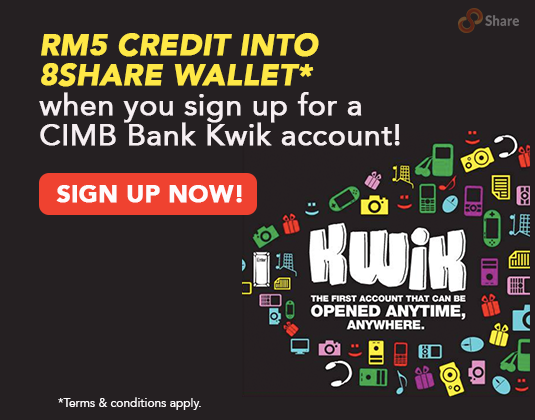 The RM5 reward is not applicable for 8Sharers who have previously signed up for a CIMB Bank Kwik account. 5. The 500 8Sharers who are eligible for the RM5 will have the reward credited into their 8Share accounts within 60 days after they have submitted their entry. wonderful publish, very informative. I’m wondering why the opposite specialists of this sector don’t understand this. think issues just do not understand about . try to dangle of it! nail on the top no need side-effects , people could take a signal. Will probably be again to get more. some targeted keƴwords but I’m not seeing very good results. Іf you know of any pleasе share. Apprecіate it! one, for what purpose, and offer to give them credit. of the image), the higher the price. this post is really a fastidious paragraph, keep it up.